Mad Picker’s New Antique and Collectible Show…The Big One! This past weekend I decided to go and check out the newest antique show to hit Metro Vancouver–The Big One! This two day show was organized by Point Blank Shows and Mad Picker Shows and was held at the Hard Rock Casino in Coquitlam, British Columbia. Getting there was easy and although there was ample free parking, I could have used a bit more signage to tell me how to find the right building. 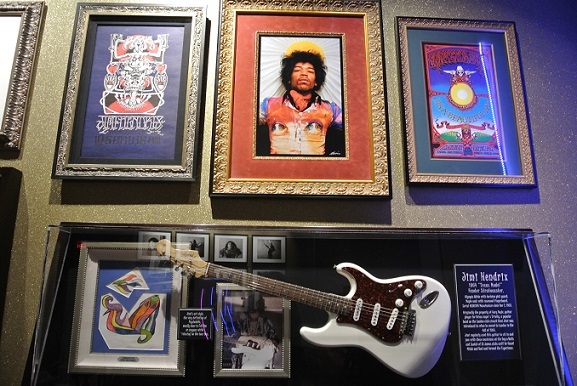 I ended up having to wind my way through the casino which was quite dark but along the way I was able to enjoy some of the impressive memorabilia displays, including this one for Jimi Hendrix. There were also displays for other rock legends, including Brian Adams. All of these displays are curated by Warwick Stone. I saw him speak on Global News earlier this week and he gets to collect memorabilia from all over the world and then his job is to display the displays in many of the Hard Rock Hotel and Casino Properties across the globe. 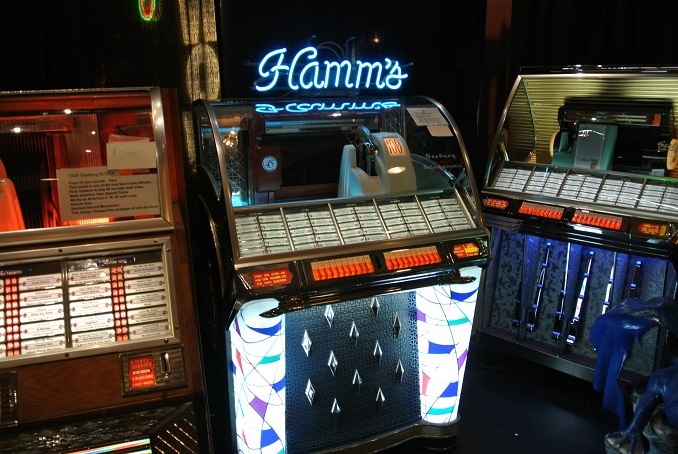 Once I found the show, I walked straight into a bright display of vintage jukeboxes proudly being displayed by the Mad Picker himself, Wayne Learie. After having a fun chat with Wayne, I found myself at Deen Hannem’s beautiful display of religious artifacts and what she calls “revamped” furniture. This seemed fitting as her shop in Langley is called Revamp Furniture Garage. I was drawn to the rustic yet elegant feel that her display had…it certainly stood out at the show. 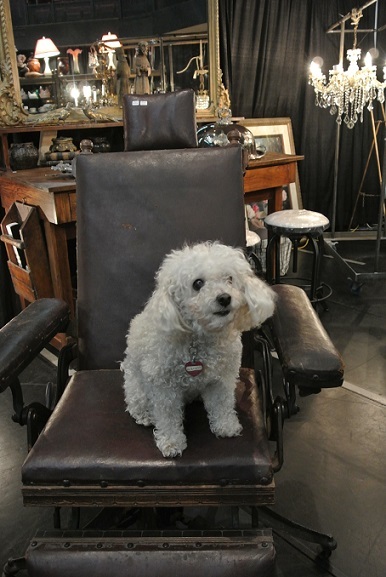 Deen also organizes the Vintage and Revamped Furniture Market in Cloverdale. The next one is set for October 3 and 4 2015. 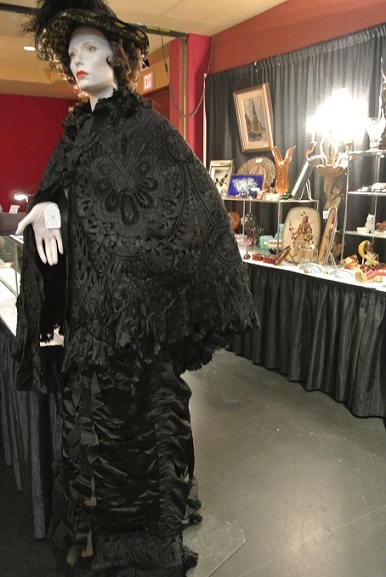 From there I discovered the most striking and complete Victorian Mourning Outfit. Randy Smith and his wife Trish from BC Acquisitions were quite proud of this rather sombre yet beautiful ensemble. Randy told me that it dates back to around 1890/1895 and was being sold for $695. 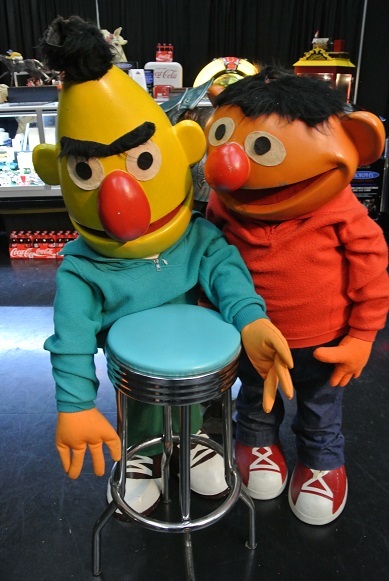 And, then next to all the finery I was completely captivated by life size versions of Sesame Street’s Bert and Ernie. They stood out at the show and it is no surprise that they sold within the first five minutes. Rick Sky from Morphy Auctions was also caught off guard but pleased to be able to sell them. Although, he did have to work out a deal with the new owners so that he could keep them as way to attract shoppers until he was done with the show season. I spoke briefly Howard Blank, from Point Blank Shows and as a result of this show being so successful…they plan to host another one in the fall. When I get those dates I will add them to the site.